You can get a set (The band and frame have been assembled together)in a gift package.And the frame is removable from the band. There are so many colors you can choose.You can choose the right color for you. 100% Brand new and made of high quality leather, durable and abrasion resistant. Both men and women can use it.You can wear it for any occasions, like doing sports, outdoor, working or study. Band Size:Small wrist size 5.5-7.3 inches (140mm-186mm);Large wrist size 6.7 - 8.3 inches (170mm-212mm). We provide friendly customer service, all you questions or e-mails will be replied within 12 hours. Any problem, please contact us before leaving us a negative feedback. We will do our best to make you be a happy customer. 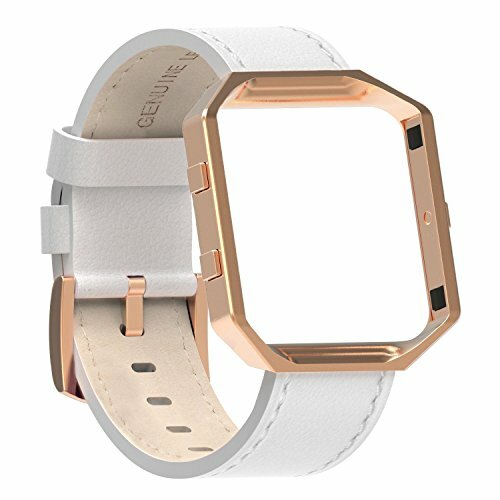 Made of Leather and Stainless Steel Housing Frame for Fitbit Blaze. Durable, Smooth and Comfortable to Wear. Fits Fitbit Perfectly,Large wrist size 6.7"- 8.3".Easy to Adjust the Length of Band,Convenient to Take on and off. Easy to Install. With Excellent and Fashionable Design for The Watch Accessory. Suits Women/Men for Leisure Places. Package:1*Austrake Fitbit Blaze Band Leather + 1* Stainless Steel Frame + 1*Austrake Gift Packaging. If you have any questions about this product by Austrake, contact us by completing and submitting the form below. If you are looking for a specif part number, please include it with your message.